Health initiatives are being matched by a sweep of innovation recalibrating every aspect of our contact with health, from booking GP appointments to managing cancer at home and supporting people with complex conditions. 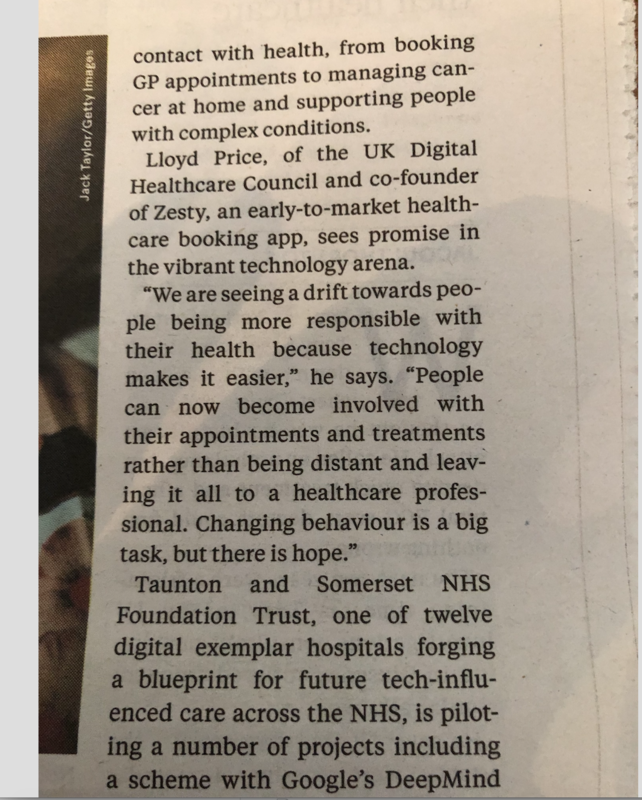 Lloyd Price, of the UK Digital Healthcare Council and co-founder of Zesty, an early-to-market healthcare booking app, sees promise in the vibrant technology arena. Taunton and Somerset NHS Foundation Trust, one of twelve digital exemplar hospitals forging a blueprint for future tech-influenced care across the NHS, is piloting a number of projects including a scheme with Google’s DeepMind Health aimed at delivering faster and better care via an app. The NHS is far from a sitting target. Collaboration with technology and pharmaceutical firms is now commonplace across the NHS with the aim of improving access to treatment, streamlining systems, eliminating waste and encouraging the public to take more responsibility for its own health.